Perhaps late 15th-century blind-tooled brown leather, gauffered with painted fleur-de-lis in lozenges. The Dannie and Hettie Heineman Collection; deposited in the Pierpont Morgan Library in 1962. 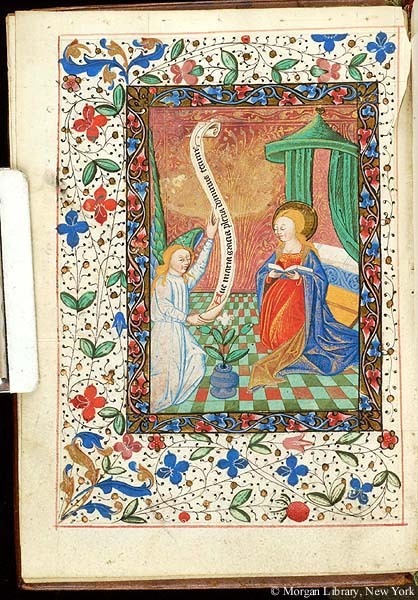 Book of hours for the use of Reims (Hours of the Virgin, Office of the Dead, calendar); written and illuminated in France, perhaps Reims, in the third quarter of the 15th century. Decoration: 4 miniatures, illuminated initials, and borders; French Gothic style.